Nationality: American. Born: Allen Stewart Konigsberg in Brooklyn, New York, 1 December 1935. Education: Attended Midwood High School, Brooklyn; New York University and City College of New York, 1953. Family: Married 1) Harlene Rosen, 1954 (divorced); the actress Louise Lasser, 1965 (divorced); one son and one daughter with the actress Mia Farrow. Career: 1952—started writing for Sid Caesar's show Caesar's Hour , also wrote for the Ed Sullivan Show and the Tonight Show ; 1961—having been urged by managers Jack Rollins and Charles Joffe to become a stand-up comedian, debuted at The Duplex, a Greenwich Village nightclub; 1964–65—in TV series That Was the Week That Was ; 1966—first play, Don't Drink the Water , opened on Broadway; 1969–70—played the leading role of Allan Felix in his own drama, Play It Again, Sam on Broadway; 1965—film acting debut in What's New, Pussycat? , his own screenplay; 1969—film directing debut in Take the Money and Run. Awards: Sylvania Award, for script of an episode of Caesar's Hour , 1957; Academy Awards for Best Director and Best Original Screenplay, and National Society of Film Critics Award, for Annie Hall , 1977; British Academy Award and New York Film Critics Award, Best Screenplay, for Manhattan , 1979; Academy Award for Best Screenplay, Golden Globe Award, and New York Film Critics Award, for Hannah and Her Sisters , 1987; D. W. Griffith Lifetime Achievement Award, Directors Guild of America, 1996. Agent: Rollins and Joffe, 130 West 57th Street, New York, NY 10019, U.S.A.
Getting Even , New York, 1971. Without Feathers , New York, 1975. Non-Being and Somethingness , New York, 1978. Side Effects , New York, 1980. Stardust Memories ), New York, 1983. Hannah and Her Sisters , New York, 1987. Purple Rose of Cairo ), New York, 1987.
" Bullets Over Broadway Danny Rose of Cairo: The Continuous Career of Woody Allen," interview with Tomm Carroll, in DGA (Los Angeles), May/June 1996. Lax, Eric, On Being Funny: Woody Allen and Comedy , New York, 1975. Yacowar, Maurice, Loser Take All: The Comic Art of Woody Allen , New York, 1979; rev. ed., 1991. Palmer, M., Woody Allen , New York, 1980. Jacobs, Diane, . . . But We Need the Eggs: The Magic of Woody Allen , New York, 1982. Brode, Douglas, Woody Allen: His Films and Career , New York, 1985. Pogel, Nancy, Woody Allen , Boston, 1987. Sinyard, Neil, The Films of Woody Allen , London, 1987. McCann, Graham, Woody Allen: New Yorker , New York, 1990. Lax, Eric, Woody Allen , New York, 1992. Groteke, Kristi, Mia & Woody , New York, 1994. Björkman, Stig, Woody Allen on Woody Allen , New York, 1995. 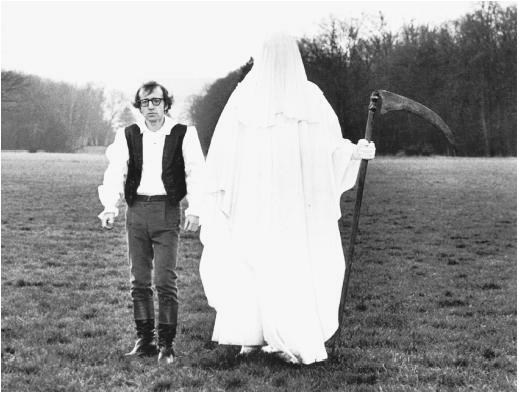 Blake, Richard Aloysius, Woody Allen: Profane and Sacred , Metuchen, New Jersey, 1995. Perspectives on Woody Allen , edited by Renee R. Curry, New York, 1996. Fox, Julian, Woody: Movies from Manhattan , Overlook Press, New York, 1996. Lee, Sander H., Woody Allen's Angst; Philosophical Commentaries on His Serious Films , McFarland & Company, Inc., Jefferson, 1997. Schickel, Richard, "The Basic Woody Allen Joke," in New York Times Magazine , 7 January 1973. Gilliatt, Penelope, "Profiles: Guilty, with an Explanation," in New Yorker , 4 February 1974. Gelmis, Joseph, "An Allen Overview" (plus critics's evaluations of three of his films), in National Society of Film Critics on Movie Comedy , New York, 1977. Gittleson, Natalie, "The Maturing of Woody Allen," in New York Times Magazine , 22 April 1979. Didion, Joan, "Review of Annie Hall , Interiors , and Manhattan ," in New York Review of Books , August 1979. McMurtry, Larry, "Woody Allen: Neighborhood Filmmaker," in American Film , September 1979. Maslin, Janet, "Woody Allen: Shunning Mastery?," in New York Times , 16 July 1982. Neibaur, James L., "Woody Allen," in Movie Comedians: The Complete Guide , Jefferson, North Carolina, 1986. Gabler, Neal, "Film View: Chaplin Blazed the Trail, Woody Allen Follows," in New York Times , 27 September 1992. Gopnik, Adam, "The Outsider," in New Yorker , 25 October 1993. McGrath, Douglas, "Woody's World," in New York , 17 October 1994. Jefferson, Margo, "Tapping the Funny Bone of American Comics," in New York Times , 14 January 1996. Approaching his sixties after enacting more than 20 important or leading roles, Woody Allen portrays the middle-aged sports writer Lenny Weinrib in Mighty Aphrodite. This 1995 film reveals some characteristics of his part in a minor role playing opposite Peter Sellers and Peter O'Toole in the 1967 What's New, Pussycat? The dimension of the character and the maturity of Allen's acting skills, however, proved to be worlds apart from the earlier film. In his first appearance he portrayed a bumbling eccentric, Victor Shakapopulis, a role executed with a narrow range of the comedian's acting skills. Giving an elaborate interview conducted by Stig Björkman for the book, Woody Allen on Woody Allen , this writer-director-actor claimed that since he was directed by another person, he was allowed to see the results of his acting but never was allowed to redo scenes to correct the faults he saw in his work. The same he claimed was true of the role of the childishly temperamental, girl-chasing Jimmy Bond, a spoof of the famous Bond secret agent series in a film called Casino Royale (1967). Not until he was able to be his own director and writer for the 1969 Take the Money and Run would Allen control his own performance. Mighty Aphrodite also displays another variation on Woody's acting talents tied to a stressful situation. As Lenny, the sportswriter in this move, he is threatened by a sadistic thug, Linda Ash's pimp, because Lenny tries to steer Linda away from prostitution. The wimp Allen had played before in so many of his films can be noticed at this point of the movie, but he gives a twist that reveals his maturity as an actor. Faced with a brute who has him by the throat, Allen covers his fear with bravado as he promises the hulk he can get him tickets for a sporting event. Another feature of the comedian's use of character traits emerges. When pressed physically or when he wants to influence someone to take action, this nerd will con people. In Mighty Aphrodite , the juxtaposition of a variety of contrasting emotions makes this one of his most deft acting performances. One-liners are, of course, the stock-in-trade gimmick for the stand-up comedian. In Mighty Aphrodite , the protagonist, face to face with a towering, amply endowed prostitute, declares whimsically, "At my age, if I made love to you, they'd have to put me on a respirator." Even monologues are sprinkled with one- and two-liners. In Annie Hall 's opening narrative, Allen as Alvy Singer, faces the camera that uses this device. In a vague attempt to look on the bright side of turning 40 as he develops a bald spot, he uses a set-up line followed by a comic reversal: "I think I'm going to get better as I get older—you know, I think I'm going to be the balding, virile type." Allen's delivery is low-keyed with a clear-cut self-depreciating agony because he has broken up with his lover, Annie. In the closing remarks of Love and Death , filmed two years earlier, he faces the camera as he used to face an audience as a stand-up comic, and sums up his philosophy of life: "If it turns out there is a God, I don't think he's evil. The worst you can say is—he's an underachiever." It should be noted that the quality of these one- and two-liner examples almost stand on their own because of Allen's innovative sense of humor. He received an Oscar nomination for acting in 1977 for Annie Hall. In addition, he received two other awards for writing and directing this film. Actresses he has groomed to excel in the cinema art have received kudos from the critics while his talent as an actor seems to be taken for granted. Woody's low-level intensity of acting not only fits his character, it also complements the characters of the other actors and actresses that play opposite him, to benefit the total production. His sharp timing from one joke to another possibly reflects his admiration for the ability of Bob Hope to deliver his lines (from Björkman's Woody Allen on Woody Allen ). While some critics believe Allen repeats the same comic portrait, they fail to see some of the complexities the actor has developed. The self-destructive whimp who is the target of bullies, both male and female, remains the principal focus of the character that Allen enacts with such skill. Often overlooked is the adeptly handled whining con man frequently employed when his faults are the aim of a detractor. Also, as the writer and director of his films, Allen places his protagonist in different plots, settings, and dramatic modes. As an actor this provides variety and nuances as he enacts each role. For example, his Everyone Says I Love You (1996) evolves into a nostalgic, romantic, comic musical, developing a sympathetic variation of his persona and gives Woody a chance to play light humor. By contrast he is comically close to a despicable character in Deconstructing Harry (1997) when he plays a man who receives the wrath of a series of harpies—his former wives. Here Allen, the writer, has given himself a part much darker than his previous work, Everyone Says I Love You. As a counter-punching con man he plays the role more aggressively and a stronger, more laughable portrait is created. In Deconstructing Harry , the dramatic mode moves to dark satire with some surrealistic scenes similar to the Pirandello stage play, Six Characters in Search of an Author. A third dramatic mode, the motion picture cartoon, allows another dimension of Allen's acting. This is revealed in the 1998 Antz. With a voice-over performance of an abstract ant drawing, his one liner gags take on a sharper, more noticeable quality and show his thespian talent in almost all film modes, even in a cartoon.